"I want to learn how to make a wig, do you have any pointers?" Quite a few folks have asked about how to make a wig and although not professional wig makers, we certainly have first-hand experience of making wigs for personal use and so we've put together two methods: there's a no-sew method on this page and a sewing method that will be up on the site shortly. Both methods outlined are personal favourites and hopefully you can use them as pointers in your pursuit of making your own wigs. If you like to live on the proverbial easy street then when making your own wig, there's nothing easier than using a stocking cap - no need to measure your head just find your own size in a stocking cap and if the cap fits....wear it (couldn't resist, soz). 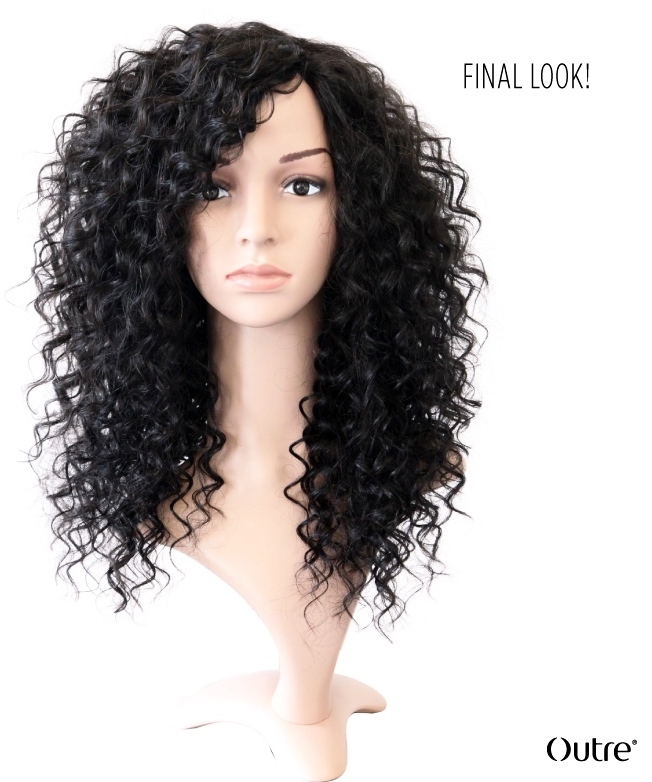 As this wig is made using glue, it should be made with the use of a plastic or polystyrene (Styrofoam) mannequin head. You can use any texture hair for your own DIY wig. Hair wefts- about three bundles should suffice (usually 100g per bundle) and you can either choose one length if you want to achieve a gradual layered look, or several different lengths to keep the overall length more consistent. This guide uses 18", 16" and 14" lengths. 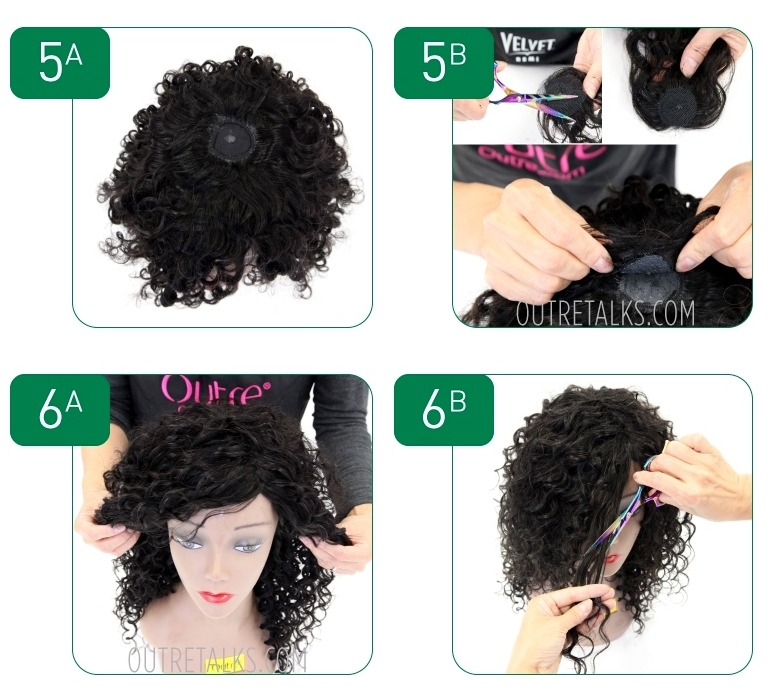 If this is the first time you're researching into how to make a wig, then have a quick look through all of the images first to get a sense of the overall pattern of laying tracks (gluing rows of hair wefts). The pink lines in images 3a and 3b show how the wefts should be attached. If you're unsure about how it will look, then use the pearl headed pins to pin the wefts in place first before you glue them. Keep gluing the hair wefts in rows in the U-shape until your rows reach about 2cm above the temple area (see images 2a and 2b). For this step (3a), you will not work from one temple around the back of the head to the other temple. The pink lines show how the wefts should be attached. Mark out the crown of the wig which is usually two - three inches from the front hairline (use a marker or pear headed pin). Attach two or three more rows of wefts to the curve only of the U-shape of the wefts and not from temple to temple (image 3a with the three pink lines shows where these three rows of wefts should be attached). You should now have a shorter u-shape when looking down at the crown of the wig. These three rows of wefts add volume (density) to the back of the wig. Turn the mannequin the front of the mannequin towards you. Starting at the front hairline of the wig (where a fringe (bangs) would be), attach three or four wefts closely together working towards the crown mark at the top of the wig (the four pink lines in image 4a show how the rows of hair weave should be attached. 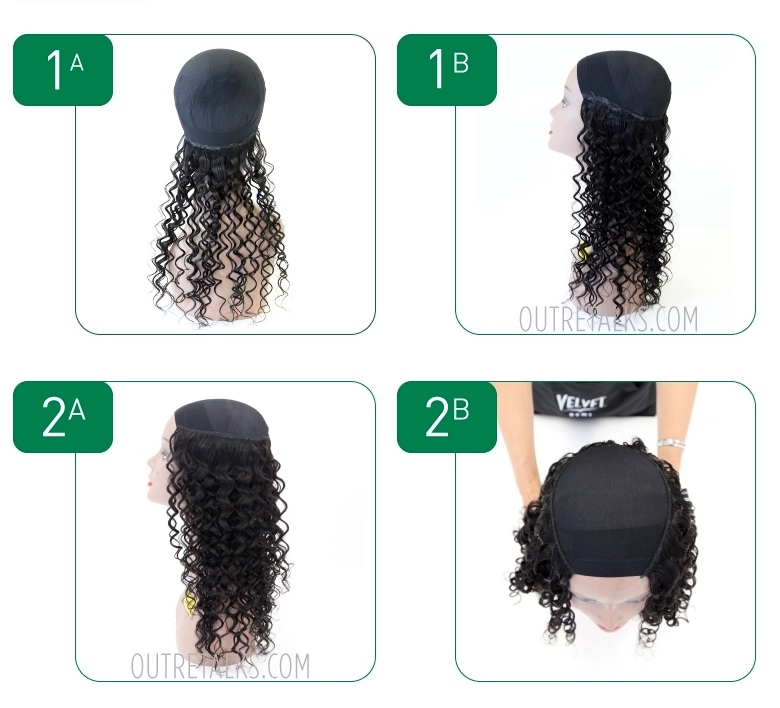 Using Lace Closure: Attach the hair weave in a circular pattern (rounds) and make sure the circular rows (rounds) of hair weave are close together so that there is fullness at the top of the wig. Keep attaching the hair weave in rounds until there is just enough room to attach the lace closure piece. 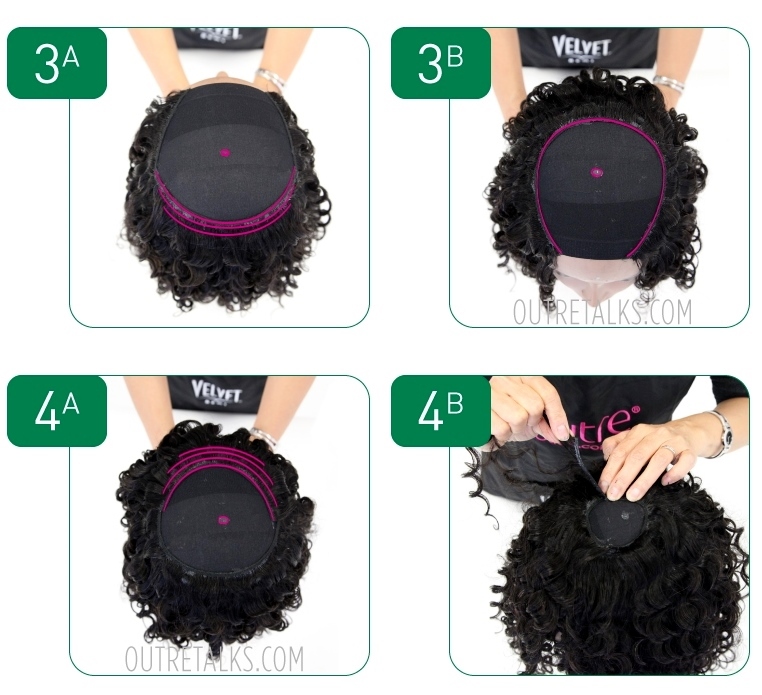 No Lace Closure: You can create your own closure piece out of weft hair - follows steps 7-9 of this DIY Wig Guide. There should be a small circular area on the wig cap that doesn't have any hair attached. Make sure your lace closure will cover the whole of this open area. Cut off the excess lace from the lace closure. Apply a thin layer of glue onto the base of the lace closure piece and to the small opening on the cap. Attach the lace closure piece to the small opening. Finger comb curly hair (use a large tooth comb for straight hair) and create a parting of your choice (side or middle) - alternatively leave it without a parting. If you want the hair to frame your face then trim the fringe at an angle. Voila! You've just learned how to make a wig! If you want to be the first to know about our next guide about how to make wig or anything else to do with lace wigs, hair extensions or hairpieces, then why not join our blog, it's easy to do and doesn't require an email address.